Hypnotic, chilling, weird and gutsy. Colin Farrell and director Yorgos Lanthimos re-team for the surrealist horror The Killing of a Sacred Deer following last year’s original feat “The Lobster” last year. Farrell is the highly esteemed surgeon Dr. Steven Murphy who befriends Martin, a young teen (Barry Keoghan) whose father was a rare patient who lost his life during an operation years before. Steven is unable to satisfy several of the young boy’s wishes, which includes coupling with his lustful widowed mother, because you know, Steven is married and fine with that. Steven doesn’t seem to love his wife to the ends of the Earth, he has fondness for his son and daughter but still has emotional limitations in regards to them. But life is rather comfortable and solid. Then Martin gives Steven an ultimatum: Kill his wife, son or daughter as a sacrifice and it will make up for the father lost years ago. If Steven cannot come to a decision, then by curse they will all meet with slow, horrific deaths. If you’ve seen Lanthimos’ “The Lobster” (and if you haven’t yet, by all means do), it’s impossible not to wonder if the society portrayed in “Sacred Deer” is a strange alternate reality on Earth, or if it’s just the Murphy family that’s odd. With Lanthimos’s disturbing, difficult to watch but undeniably interesting “Dogtooth” (I’ve seen it twice), it was easy enough to single out the one sick puppeteer playing God. Surgeons often play God, and Farrell is playing a man with a highly aggrandized ego who is looked upon as a God by his family and many peers. The boy of this story is something of an antichrist. Sickness begins to take control of Steven’s family, one by one. Steven persists that it is a medical fluke and that reasonable diagnosed conditions always have a cure. It is Steven’s wife who has to coax him into accepting that there is a supernatural force at play, and that he is going to have to be man enough to take Martin’s hex seriously. 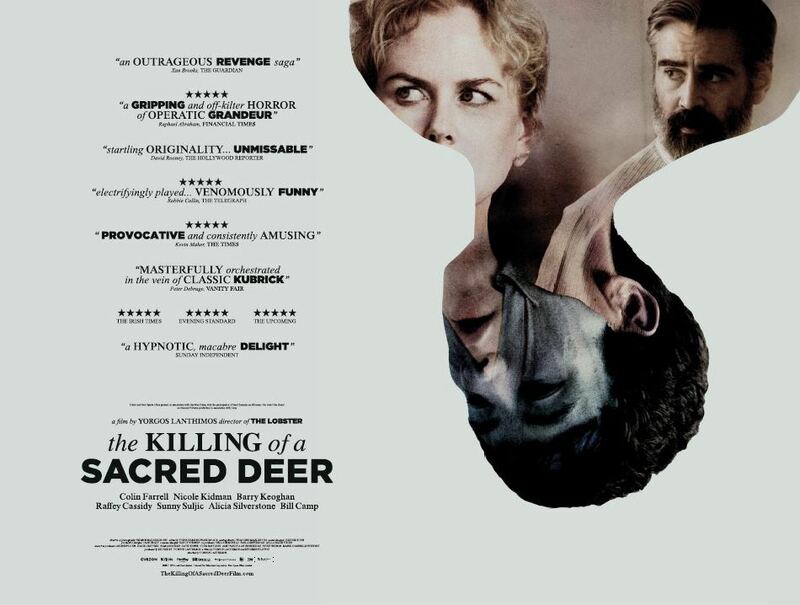 Lanthimos is an artist, and “Sacred Deer” is an art film, which means it can go dark places that a commercial film looking for uplift would never be willing to go. There’s great suspense, quite unconventional suspense, in how Steven will use implacable logic to deal with this situation. It’s a parable, and it’s a surrealist horror. In nearly forty years, no director has come close until now with imitating Stanley Kubrick’s peerless horror classic “The Shining,” but I believe Lanthimos is the first to truly use long gliding camera takes and baroque music cues, discordant sound effects to truly create a spellbinding effect. I wish I could say “Sacred Deer” was a perfect film, but some of its early episodes are kind of minor and don’t always seize you, but that’s a quibble because its second half truly grabs you by the throat. There are images in the second half that I find unforgettable. Likely to be underappreciated is Farrell, who has done the best work of his career the last couple of years (“The Lobster,” “The Beguiled,” now “Sacred Deer”). He was once simply considered a matinee idol with above average acting chops. These days, he is severely good, seasoned and intellectual, slightly impenetrable but enigmatic – which is what the film needs from him. We don’t know where his loyalties lie, and he’s so self-important that we cannot predict what course of actions he will take because his type of thinking is contrast to what other fathers in his position would do. His cold detachment only adds to the enticement of knowing how “Sacred Deer” will all turn out. I might be the only person who has Farrell as the actor of the year, but we’re near the end of the year, and he’s my choice for Best Actor. And while it’s a cliché that an actress who bares all is “courageous,” I’m sorry, but courageous is the right word to describe Nicole Kidman as his wife. Her best acting comes when she spurs her husband in how he should act in all this. Thank God, too, that the film isn’t resolved by a character waking up. “Sacred Deer” isn’t real stuff, it’s a parable, but it has the hypnotic power into making you believe it’s real and that a horrible curse cannot be broken. I cannot believe anyone not having the curiosity to see all this for themselves. Film Cousins: “The Shining” (1980); “Sophie’s Choice” (1982); “Dogtooth” (2010, Greece); “The Lobster” (2016).